Beets are very high in dietary nitrates, which may enhance athletic performance and increase blood flow. This is not only beneficial for athletes, but also in patients suffering from illnesses that affect circulation and tissue oxygenation: patients with high blood pressure, emphysema, and peripheral artery disease saw improvements in their symptoms with beet juice supplementation. Beets may also improve blood flow through the brain, particularly the frontal lobes, which may protect against age-associated dementia. Considering their vasodilatory effects, beets may likely be useful in the treatment of erectile dysfunction. 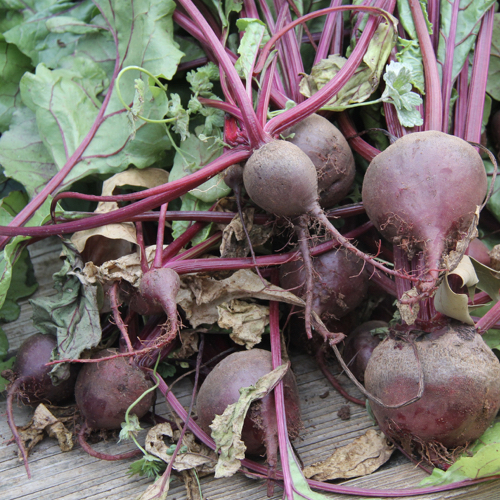 How do nitrates from the beet juice work? When mixed with our saliva, bacteria in our mouths convert dietary nitrates into nitrites, which can then converted to nitric oxide. This nitric oxide is what improves cellular respiration. In addition to their nitrate content, beets are also good sources of antioxidants and are one of the few vegetables that do not lose any antioxidant power through a variety of cooking methods. They have also been shown to decrease the growth rates cancer cells in vitro. Beets also bind and remove bile-acids in the colon, which are associated with premature degenerative diseases. Are there any downsides to eating beets? Beets are unsuitable for infants to consume and they may promote oxalate kidney stones in patients predisposed to their formation. For the majority of the population, though, beet consumption is safe, with the only side-effect being a portion of people passing harmless, pink urine. Image Credit: UGA College of Ag & Environmental Sciences / Flickr. This image has been modified. What is the latest science on the performance-enhancing qualities of nitrate-rich vegetables?